Ecuador is divided into various provinces and each has it's own capital. Quito where I live for example is the capital of the province of Pichincha and it also happens to be the capital city of Ecuador. This past weekend we decided to venture to Esmeraldas which is the capital city of the province of Esmeraldas. According to history, the Spanish first landed in Ecuador through Esmeraldas and they encountered indigenous people of the area bedecked in emeralds so they thought the whole place was full of emeralds thus the name Esmeraldas. 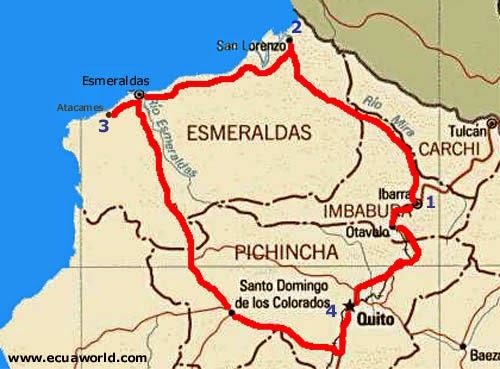 When you visit Ecuador and inquire about black people, you will most likely be directed to Esmeraldas where most of the black population in this country is to be found. The black population in this area were brought on as slaves by the Spanish and later on also consisted of runaway slaves from the sugar plantations in Colombia. We headed to Esmeraldas from Quito on Friday night through the bus terminal Carcelen that serves north bound routes. The trip took about 7 hours before arriving to the city of Esmeraldas so we got there early Saturday morning. As we were approaching the city during the trip I could not help but notice how lush and green the surrounding areas were, It is after all known as the greenest province in Ecuador. It was also very noticeable how the population changed, as we saw more black people. The landscape was very beautiful, too bad I was taking these pictures from the bus so I couldn't get really good shots but at least it gives you an idea of what I am talking about. The town itself isn't something to write home about and it actually looks a bit sketchy and rough around the edges so we decided to head to one of the popular beaches around the area. I had heard Atacames was one of the best beaches to be found in Esmeraldas and it happened to be about 20 minutes by bus from the city so it was easily reachable from where we were. When we got to the beach it wasn't as packed as we thought which I actually enjoyed and found really relaxing, we were told during holidays and carnival it gets very busy and chaotic as people from Quito travel here to relax and enjoy themselves. After settling in our hostel we headed out to explore the small beach town of Atacames. The weather was a bit overcast but the temperature was still warm and a bit humid, I found the weather ideal for walking around because the sun wasn't out and the heat wasn't over bearing. This place had the best Piña Coladas I have ever tasted. All we did on our first day in Atacames was: lounge by the beach with the occasional dip in the ocean, eat sea food, drink the many fruit juices to be found in the area and just chill. Later on in the evening we went out to one of the bars along the beach to listen to music and drink a little before calling it a night. On the second day we had a late breakfast and explored the surrounding areas a bit, the sun was out on this day and it promised to be quite a hot day by the look of things, compared to the previous day. We were both glad we wouldn't be around to experience that heat. Most of the side streets looked like this, the beach was where all the action was to be found. If you are a dog is Atacames all you do is just chill like this on the beach or on the side walks, this pose was a killer. That's it folks, we left for Quito after getting a taste of the beach life. Coming from Quito was straight forward and easy enough but getting back was quite an ordeal! we took a 20 minute bus ride to Esmeraldas, from there we took a 7 hour bus ride to Quito. In Quito we couldn't find a direct trolley bus that would take us to where we needed to go because apparently the routes change on Sunday evenings. We had to take a trolley bus to another station and from there take another bus to drop us off to where we needed to go. When we got to our last stop we couldn't find a bus that was heading directly to our Barrio so ended up taking a taxi. In short, 4 bus rides and a taxi ride later we finally got home! exhausted as hell but happy to have made the trip to Esmeraldas. It is hot in Esmeraldas, not only is it hot but it's also humid so the combination of both is overwhelming especially if you don't like too much heat. When we first arrived we were both dressed in warm clothes because Quito's weather was cooler but after stepping out of the bus we could not wait to change into cooler clothes. The dress code in Atacames and Esmeraldas seems to consist of: shorts, tank tops, short dresses, sandals and basically as little clothing as possible because of the heat. Speaking of dress codes, it was refreshing not seeing men in Esmeraldas gawk at women like a piece of meat because of their dressing no matter how little they had on. In Quito it's quite the opposite, I don't know if some of the men are sexually repressed, uncouth, easily excitable, or all of the mentioned. You should see how they gawk at women it can be unnerving at times. On our first day in Atacames the sun wasn't out but I guess the rays were still pretty strong because my boyfriend and I actually got sunburn and we were not the only ones. I can only imagine how much worse it would have been if the sun was out. I don't know what the deal is around Atacames but we saw so many signs indicating land or houses for sale. The signs looked as if they had been in place for quite a long time and truth be told, some of the properties for sale looked a bit deserted and run down. At our hostel in Atacames the water coming from the taps was hard water making it very uncomfortable to even shower. It changed how the skin texture felt and soap wouldn't lather too well, coming out of the shower I just felt sticky plus the heat and humidity wasn't helping. I took the longest shower ever when we got back to Quito. This is very nice, J, very nice!